Scissor City offer a premium sharpening service for all hairdressing, pet and dog grooming scissors. 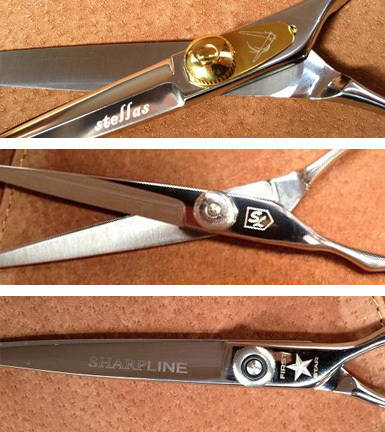 Sharpening and tensioning your scissors is very important. For professionals, scissors need daily to weekly adjustments to make sure they are at the right tension to minimise hand strain and help to keep up sharpness. If scissors are too loose, this will cause the edges to become blunt. If they are too tight, this will cause strain on your thumbs and can lead to RSI (repetitive strain injury). To learn how to tension your scissors click here. If you use your scissors regularly, you will probably be aware when your scissors need sharpening. If blunt, scissors will also cause damage to your clients hair or your pets fur, stretching the hair/fur and leaving split ends etc. Average cost is now around $70. plus Courier oneway with a max 7day turn around. To get your scissors professionally sharpened please contact us on [e-mail], 06 3554158 or 0274 303994 for our premium scissor sharpening service.